The Government has sanctioned GST refunds worth thousands of crores as per the latest figures but inspite of that most people are still facing problems applying for refund while some are facing issues with getting there GST refund issued after application. 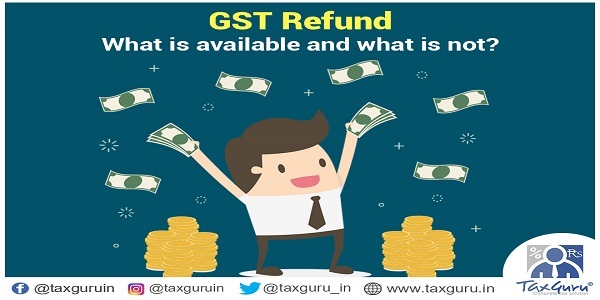 In the course of this article we will try to solve few issues relating to GST refunds. In this article, we are going to see what are the cases where refund is available and what refunds are available and what aren’t. This refund is for refund of unutilised balances in the electronic cash ledger under different heads such as CGST, SGST, IGST late fee penalty etc. Ques: When can there be a case where refund will be due in the cash ledger? Ans: Refunds of excess in the cash ledger can arise if the registered person for example has paid cash under the wrong GST head. Suppose Mr. X had to pay Rs 1 lac as IGST but instead he has paid Rs. 1 lac as CGST by mistake. Therefore, now he needs to pay Rs. 1 lac under IGST and claim the refund of excess balance in CGST if he cannot utilize this amount against his subsequent payments. This is the case where refund of unutilised input tax credit is available to the registered person. 1) Goods or Services need to be exported. 2) Exporter must have executed a Letter of Undertaking for zero-rating the exports. 3) ITC must be claimed in the returns within the due time and must be reflecting in the electronic credit ledger at the time of refund application. 4) The ITC Claimed must not be fake or bogus. 5) All returns i.e GSTR-1 and GSTR-3B for the tax period must be filed. Ques: Is there any input on which refund is not available in case of Export of Goods & Services without Payment of Integrated Tax? Ans: Yes, when the exporter exercises the option to zero- rate his exports by executing an LUT then he is not eligible to claim refund of inputs on capital goods purchased by him. Therefore, in case of exports of goods under LUT, no refund of inputs on capital goods is available. Hence, if there is major input on capital goods in case of an exporter, then he needs to do an analysis of whether he should apply for LUT or pay IGST on export without LUT and claim input on capital goods against output IGST. This is a special case of refund available in some industries where the tax rate on inputs is higher than the tax on outputs and hence there is unutilized accumulated tax credit for which refund can be applied. Ques: Are there any inputs on which refund is not available in case of Refund on account of ITC accumulated due to Inverted Tax Structure? Ans: Yes in case of Refund on account of ITC accumulated due to Inverted Tax Structure refund is only available on inputs where there is inverted duty structure i.e the inputs directly used for output. Note that here refunds on input services and capital goods isn’t available as this is a special case where refund only of inputs directly used is available. Exports whether of services or goods are zero rated. Hence, even if the exporter does not exercise the option of LUT and decides to pay the tax. He will still be entitled to refund of taxes paid by him on exports. Exporters can claim the refund of IGST paid on export of services through this option. Note that the option to apply for refund of IGST Paid on exports is available only in case of services and is not available in case of IGST paid on export of goods. In case of export of goods with payment of tax, the taxes will be refunded automatically by the customs/GST department if the data filed as per shipping bills matches with that shown in the GST Returns. Supplies to SEZ are treated as if they are export supplies; therefore there is an option to execute an LUT by the supplier in case of supplies to SEZ unit/developer also. There are separate options available on the GST Portal for application of refund in case of SEZ Supplies depending on whether the supplier has paid tax on such supplies or not. Just as normal exports, if the exporter executes an LUT then he need not pay taxes on supplies to SEZ and is entitled for refund on input taxes paid on these supplies. If he however decides to pay taxes on SEZ supplies, then he will be entitled to get the refund of IGST Paid on such supplies. There are some supplies which are deemed as exports under the law called deemed exports. In case of deemed exports, refund can either be applied by the supplier or by the recipient. This option is for refund to the recipient of deemed exports. The supplier of deemed exports can apply for refund only in case the recipient has not taken credit on supplies made to him and the recipient furnishes an undertaking that no input tax credit on such supplies has been availed of by him. Also refund by the supplier can only be applied and claimed, if the recipient furnishes an undertaking that he will not apply for refund on such supplies and that the supplier may claim the refund on such supplies. Ques: is there a situation where refund is still not available? Ans: There are 7 situations where refund can be applied by the dealers and there is one situation where there will be automatic refund i.e refund on taxes paid for exports of Goods without LUT. However, there is still a situation where refund is not available that being refund of excess amount lying in the electronic credit ledger not due to inverted duty structure. There can be a situation where the supplier purchases goods or avails the services but due to some reason is not able to make the supplies. In this case he has availed the input tax credit on his inwards supplies but these cannot be set-off against his outward supplies as there are none. In this case there will be excess amount lying in the electronic credit ledger which is unutilised due to their being no sales and such excess cannot be taken as refund as there is no mechanism yet to apply for refund of excess lying in the electronic credit for reasons other than inverted duty structure. Where a supplier starts his own venture and incurs expense on purchase of goods or services with GST but due to some reason has to close down his business without making any sales. In this case no refund of excess lying in the electronic credit ledger on such purchases will be available as there is no sale. Also, if there is a clearance sale and the supplier decides to sell the goods at a rate lower than its cost resulting in output tax being lower than the input taxes. In this situation also the supplier will not get any refund of balance lying in the electronic credit ledger. We are online sellers selling Garments (GST 5%). While the website commission /shipping and other services come under 18% bracket, the effective input is way higher than the output. Is there any way the surplus input refund can be claimed ? We are manufacturer exporters and export around 50-60% of our production. 1. We procure of major inputs from M/S Reliance Industries Ltd against advance license invalidated in their favour by DGFT. We procure our inputs on payment of IGST. 3. We export our product on payment of IGST and take subsequent IGST refund at present. received supply on which the benefit of Govt. of India Notification No. 48/2017 of Central Tax…………. Does CBEC circular No 70/44/2018-GST dated 26th Oct 18 and Notification no 54/2018-Central Tax. restricts our claim for IGST refund in any way? For above Answer any Government Official Notification or Rules Available ? how to claim refund of advance gst paid by casual register person and registration denied/not granted. it is not covered by above article. even dept officer are not taking such refund application . We are traders of industrial raw materials and have our own fleet of commericial light commericial vehicles which are purchased in the name of our trading unit.Is GST on purchase allowed to be set off against our output GST on sale of chemicals as we have to deliver the material to customers and the delivery charges are included in the sale price. We had Purchased good in the month of August 2017 , September , October , November , December till February and we paid IGST to the manufacturer. All the good were respectively exported under bond mentioning export without payment of IGST. Now how on this earth can we claim this IGST that we have paid to manufacturer while purchasing. As we are not able to get this amnt back. No one is able to guide properly. Two way benefits is not available. When u enjoyed once non tax payment benefit, then how u expect to get refund of ther same? It is advisable to set of your I GST credit with export liability ( not availing LUT benefit) and thereafter claim the output I GST ). You can get refund of taxes paid on inputs EXCEPT CAPITAL GOODS even if you have LUT. If you have any issues regarding refund you can contact me. My number and email id are given with this article.